Raila Odinga arrived in Mombasa, officially opened uwanja wa Mbuzi stadium and is expected to address peope in a Rally at Tononoka grounds. - Bana Kenya News, Real African Network Tubanane. 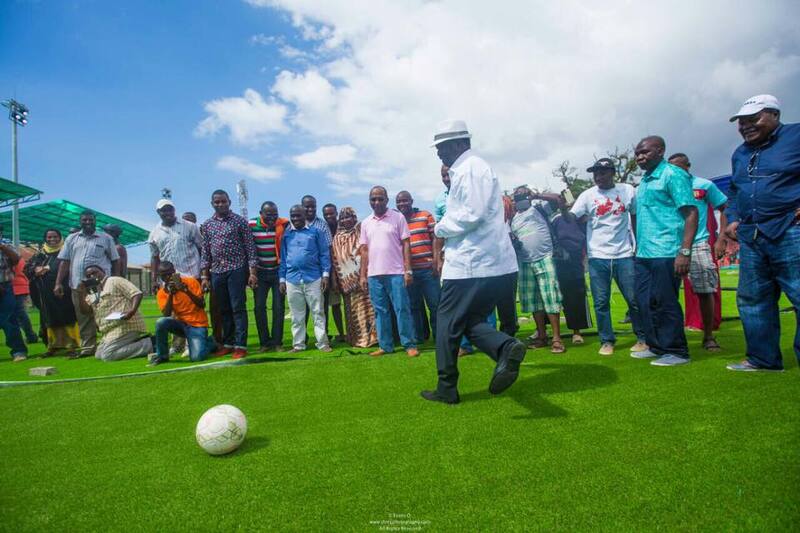 Home featured Mombasa Raila Odinga arrived in Mombasa, officially opened uwanja wa Mbuzi stadium and is expected to address peope in a Rally at Tononoka grounds. Raila Odinga arrived in Mombasa, officially opened uwanja wa Mbuzi stadium and is expected to address peope in a Rally at Tononoka grounds. The ODM leader Raila Odinga has landed in Mombasa and welcomed by the Mombasa Governor Ali Hassan Joho. The Governor welcomed the ODM leader at the Moi International Airport today morning and they visited some areas in Changamwe and later opened the Uwanja wa Mbuzi football pitch at Kongowea. The ODM leader said that the Government now moves with high-speed opening projects everywhere but they have no money. The loan is not yet matured. The governor will be responsible for the tomorrows' rally at the Tononoka stadium. The Jubilee Gubernatorial aspirant Suleiman Shahbaal also organised another counter rally at Mvita Grounds. The Police have vowed to disrupt rally at the Mvita grounds before they were not alerted early. Another counter rally will be held in Malindi and will be led by the Kilifi Jubilee gubernatorial Gideon Mung'aro. The rally head will be expected to endorse Malindi Jubilee MP aspirant Philip Charo. The ODM leader came to the Coast region following massive rallies did by the Jubilee government. The rallies composed of the President and his deputy urged the coastal people to ignore the opposition and support the government. It is criticised that the ODM leader came to make sure things are back in order.